The Hair of Zoe Fleefenbacher Goes to School is a great new picture book by wonderful author, Laurie Halse Adnerson. Poor Zoe has wild, out-of-control hair that has a mind of it’s own. Not only does it have a mind of it’s own, but it can perform tasks such as setting the table or cleaning. Now it wasn’t always poor zoe-her parents loved her hair. She loved her hair. Her kindergarten teacher loved her hair. But come first grade, Zoe became poor Zoe with a teacher that believes in RULES and order. The hair is attempted to be controlled, but it fights back. Hats-nope. Eventually scrunchies, barrettes, clips, headbands, rubber bands, bobby pins and duct tape-all at the same time are able to keep the hair under control. The story reminds me a little of Plantzilla by Jerdine Nolen and Brian Kielher and illustrated by one of favorite illustrators-David Catrow. In Plantzilla the plant, not the hair, has a life of its own and is able to perform some amazing feats. It would be fun to read the books back-to-back and look for similarities or differences. I think kids (especially kindergartners and first graders) will find The Hair of Zoe very funny. It would be a good first week of school book when some students are apprehensive about their teacher. They, like Zoe, will find common ground with their new teacher and have a very good year. The Vowel Family : A Tale of Lost Letters by Sally M. Walker (2008) is a funny picture book that highlights the importance of vowels in words. I’ve included a few excerpts below to highlight the fun. What words can you make when you add vowels to the letters below? Ftr Alan and Ellen, the twns, were brn, ther parents gggld wth glee. Alan and Ellen’s clear speech made sense. Lfe was better. Bt t wasn’t perfect. Tried adopting pets, but it wasn’t until the birth of Iris and Otto joined the family that things made sense. But, Otto gets lost and Aunt Cyndy, the police officer needs to help them find the missing boy. They find him in the library attending story hour. It’s funny/interesting that you can read and understand the story, even without the vowels. I wonder if that is due to years of interpretting students’ misspellings, or if everyone can read it easily. I think students of all ages would love this book for different reasons. Check it out. Put It on the List! is the first book by new author/illustrator Kristen Darbyshire and is due out mid February. I have to love a middle school art teacher who writes and illustrates picture books AND can draw with her toes. Teaching, illustrating, writing–all three are impressive on their own. Put It on the List! is a familiar phrase to many moms out there. The never ending trips to the grocery store, coming home to unload and finding out you didn’t know you were out of a certain item.—cereal, toilet paper, etc. we had pancakes, but no syrup. We had toothbrushes, no toothpaste. Teachers will enjoy pairing this book with Cookie’s Week or any other “days of the week” book. “So did you teacher teach you about idioms today?” I ask, thinking it had to be a coincidence that she just talked about it on the day I was sharing the book with him. Surely he couldn’t have remembered that from some earlier lesson! “No Mom. I learned it from listening to stink,” he replies matter-of-factedly. “You know the audiobook I’ve been listening to in my room? I learned it from the book Stink,” he answers (probably thinking “Duh mom!”). Hmmm! I love audiobooks for so many reasons! Add that to the list! I’ve loved everything by Lane Smith that I’ve encountered, but I didn’t love the story of two donkey friends, one “geeky” and one not. The non-geek keeps listing all these mean things that he thinks the “geek” is upset with him about, most of which entail the “non-geek” either making fun of the “geek” or not sticking up for his friend. I didn’t really care for how the book does not really address that issue or end with a positive message. The illustration style is fun as always, but the story is not as strong as what I’ve come to expect from Smith. If it was a movie in the theatre, I’d say, “Wait until it comes out on video.” Or in this case, paperback. I’ve really liked all the Steve Jenkins books that I have read and this is no exception. The artwork alone was enough to get me to purchase the book, and the narrative is just as strong. 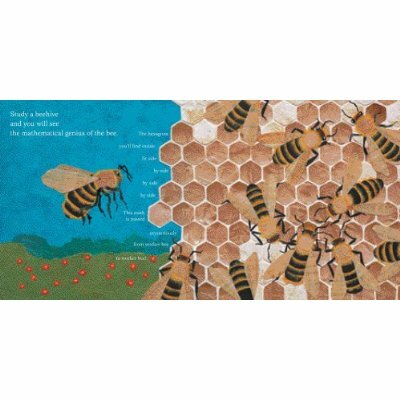 Our school uses the Everyday Math program and I was immediately struck by how both the first grade teachers and the sixth grade teachers could use the book to tie into patterns. 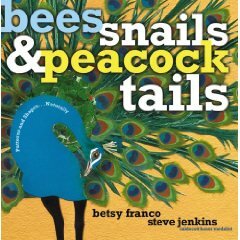 bees, snails, & peacock tails: patterns & shapes…naturally is a great new must-have to any library or classroom.